1. Saute yummy vegetables and spices together in olive oil. A few years ago, my sister and I were at the store and grabbed a can of Campbell’s tomato soup, thinking we’d have a quick dinner together. When we heated the soup later, we were sadly disillusioned. I hadn’t expected to be able to taste the high fructose corn syrup that Campbell’s had (inexplicably) added. We tried seasoning it, but in the end we had to give up: the soup of our childhood did not taste anything like we remembered. 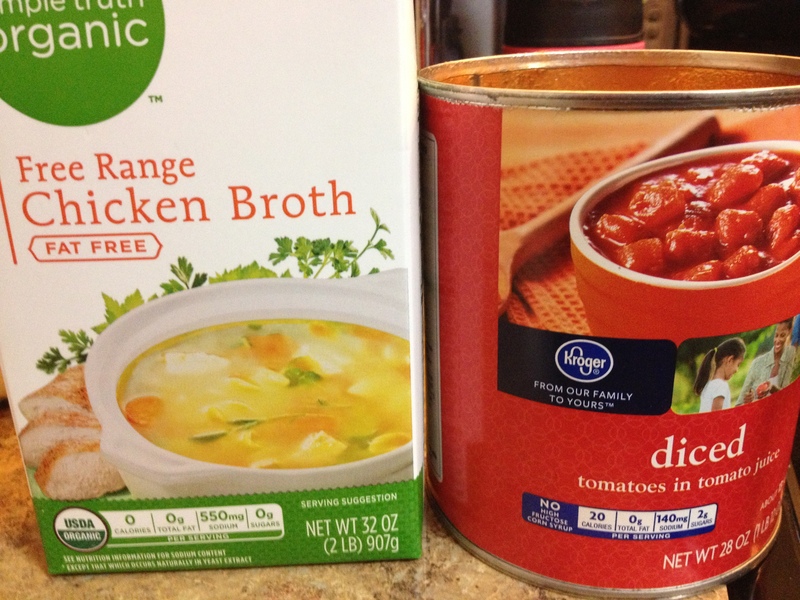 Giving up Campbell’s tomato soup was easy since it wasn’t even edible to me. 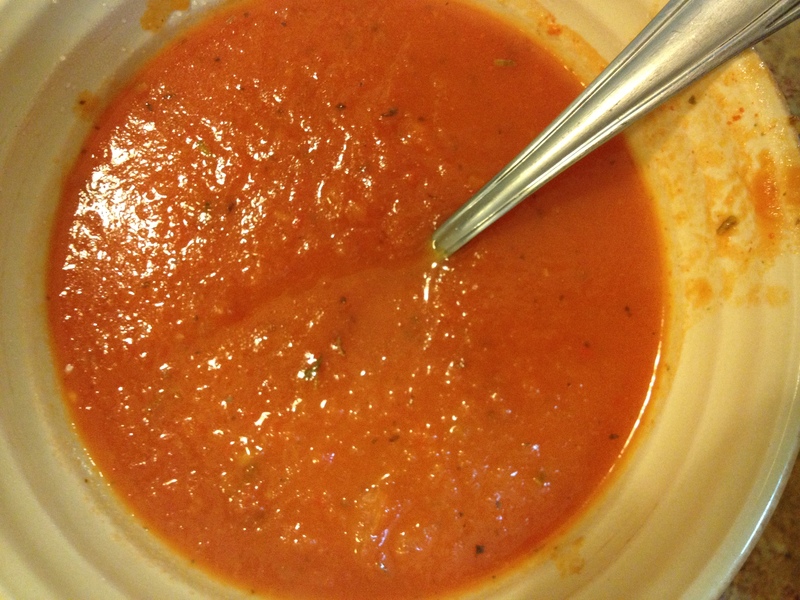 However, giving up tomato soup in general was impossible–it’s the best thing ever with grilled cheese. So here’s a quick recipe that doesn’t involve long cooking times, roasting tomatoes or red peppers, or doing any other sort of elaborate cooking. I’m sure you can find more delicious recipes out there, but this is a good, basic, and fast way to have soup without having to buy the high-fructose-corn-syrup version. 2. Add the liquid ingredients to make the soup base. Sauté onion in olive oil until translucent (about 2-3 minutes). Add in garlic, then tomatoes and Italian seasoning, and sauté another minute or so (sautéing your spices makes even dried spices far more flavorful, and it means you don’t have to later simmer the soup quite as long). 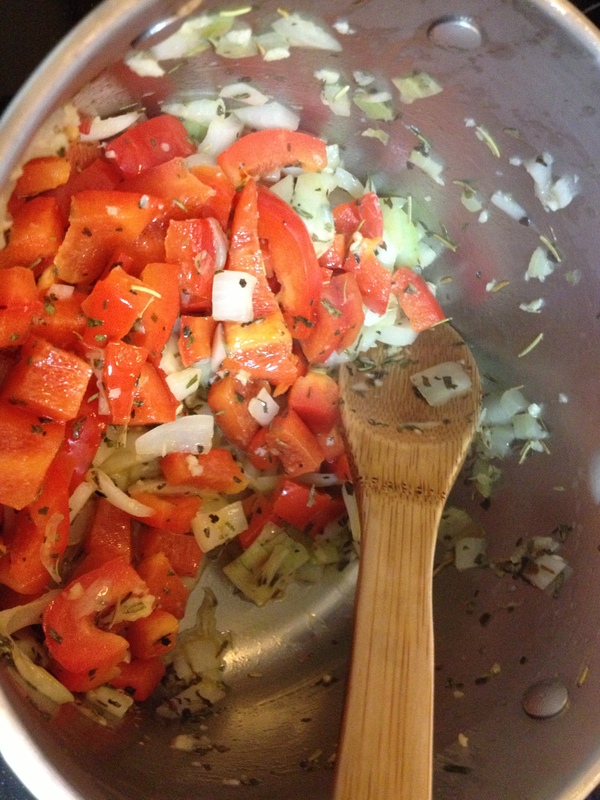 Just before the veggies start to stick, dump in can of tomatoes. If you, like Campbell’s, feel the need to sweeten your soup, you can add about a teaspoon of sugar, but please don’t overdo it! I don’t find I really miss the sugar, and it’s just extra calories that I don’t need. Allow to simmer for 20-30 minutes, until the flavors mix together. Blend with a handheld blender (also called a stick blender or immersion blender–if there was one kitchen appliance I could take to a desert island, it would be my handheld blender). 3. Simmer, blend with handheld blender, and serve with grilled cheese!